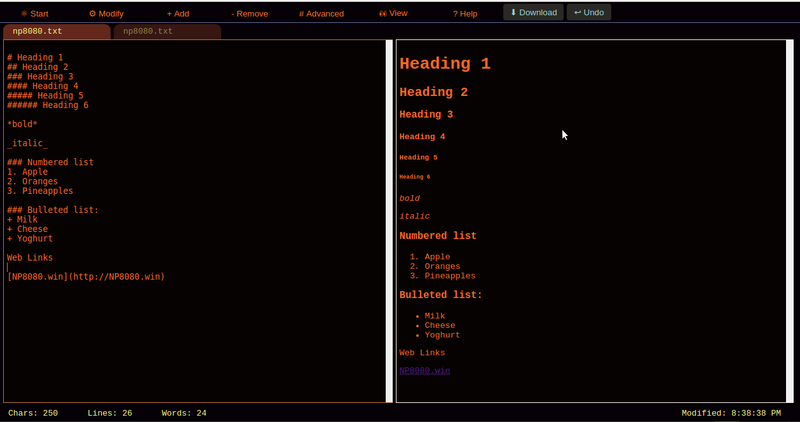 NP8080 is a simple notepad type app for the web with some text processing features. It is lightweight and fast to load. 100% functionality when offline so great for Chromebooks. I use it daily as a scratchpad, a markdown editor and for notes. Particularly handy when working in the context of a web browser as switching tabs is far smoother than switching applications. Feature requests, bug reports and pull requests welcome! NP8080 is written in Angular Dart and can be hosted on any web server as it is client-side. Find out more about Dart. Moved to Angular Dart 4.0.0 release. Improved Reader view a) Removed dialog header and b) use theme border colour. Added Numbering entry to Modify menu. Fixed ordering of Manual content to match menu order. Removed link to Notesboard 8080. Editing a document name can be confirmed by pressing return. Selecting a timestamp can made by pressing return. Border of editor now matches theme. Focus set on default dialog inputs. Moved to Angular Dart Beta. Added normalise.css and reorganised CSS. Updated About dialog to match Manual & Updated Welcome text. Menus now close afterclick on item rather than relying on MouseOut. Added Split (by a specified delimiter) feature under modify. Added Reader option to View menu. Custom time/date format in Timestamp dialog. Moved to Angular Dart 4 Alpha 1. Can now Delete lines that do not contain a string. Added Manual under Help menu. Moved to Angular Dart 4 Alpha. Angular package import changed to 'angular'. Persist markdown preview display on/off setting. Dialogs refactored with common base class. Styling updates to dialog headers. Replace dialog non-modal and can be moved with buttons in header bar. Replace dialog can insert a newline before the replace also. Update pubspec for 'Dart 2.0' dev releases. Added first shortcut [Ctrl-Q] to display Replace dialog. Moved to use minibus package for sending events. Preview for generate sequence added. Timestamp is now a dialog with a selection of formats. Moved to use stringprocess package for all string operations. No confirmation required for Start items if note is blank. Dialogs now use Eventbus to trigger modal display. Services now at the application level. Styling updated for UI and Editor. Generate can now add a new line after each string being repeated. New advanced menu with the Uri Encode/Decode options. A web based Text editor built with Angular Dart.